Academically & professionally qualified preferably a science graduate slim,​pretty daughter is sought for 26 year old son of Buddhist Govi parents. He is fair,​5’10”,​non-smoker with sober habits. Educated in a leading school in Colombo and currently reading for a MSc. in Mechatronics Engineering in Europe. An educated pretty daughter below 34 from a respectable family sought by Sinhala Buddhist parents for their handsome son 1980,​5’5” Europe graduated Hotellier,​businessman owns properties. Reply with details. No differences. d​e​e​p​r​o​p​2​9​@​g​m​a​i​l​.​c​o​m​0912294054. A daughter is sought for our son 38 handsome young looking Sinhala Buddhist living in Australia graduate of Western Sydney University,​self-employed independent & having his own assets,​had his early education at Royal College,​Colombo,​mother a teacher,​father retired from corporate capacity in a Multinational Organization. The family resides in Australia for decades is seeking a simple graceful accomplished daughter preferably professionally qualified & willing to be emplyed or assist in own business. Gifts are of no interest. 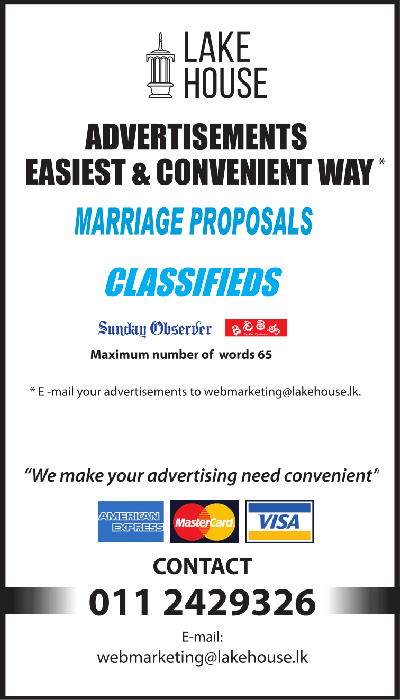 Buddhist G/​K/​D respectable parents from Colombo seek pretty fair academically qualified well-mannered daughter for our son 28,​5’11” with pleasing personality,​well established postgraduate qualified Journalist currently employed as an Editor and head of the division in a reputed company in Colombo. Email - d​r​j​p​r​o​p​@​g​m​a​i​l​.​c​o​m​Telephone - 0112811866. Kandyan Govi Buddhist parents looking for smart educated and pretty daughter for their son living in USA,​holds a Masters Degree in computer engineering and work as a Software Engineer to a reputed company in Washington DC. He is 29 years,​6’2”,​NS/​TT and kind personality. He is visiting Sri Lanka first week of March for a vacation. Reply with TP numbers. Email: d​p​c​i​s​9​2​5​@​g​m​a​i​l​.​c​o​m​0312234540. Mother from Dalugama Kiribathgoda seeks a well-educated,​pretty girl age between 28 yrs. to 35 yrs. for our younger son aged 44 yrs. height 5’7”. He was a Telecom Engineer in U.K. but now he is involved in their own business,​the Rolex agents in Sri Lanka and he is a partner. His horoscope Kuja in the 2nd house and Shani in the 8th house. Ratnapura District B/​G 1989/​08 5’9” retired parents are seeking a pretty bride for their handsome Aircraft Technician son with house and a car,​working for an International Airline stationed in Katunayaka Airport. Medical,​banking or other suitable industry preferred. Please contact with the horoscope. Only sister is married and based in the United Kingdom. 045-2265790. Well established in UK (British citizen),​well educated and a Director of a UK company with high income and substantial assets (properties & other) in UK and Sri Lanka. B/​G,​42,​6ft tall,​medium built,​fair and handsome & very young looking (looks in mid 30s),​divorced with one child,​is seeking a slim,​good looking and down to earth partner to settle in UK. Pls reply with details. E-mail: m​p​@​u​a​s​.​o​r​g​.​u​k​All correspondence treated confidential. We are looking for a suitable daughter who is willing to migrate to Australia,​for our son,​Sinhala,​Buddhist,​employed in car trade and the Motor Mechanical Industry in Sydney. He is an Australian citizen,​30 yrs of age,​5’7’’ tall,​professionally qualified,​smart and attractive. Caste immaterial. She should be educated to be able to work in Australia. Please reply to; c​r​a​t​h​u​@​h​o​t​m​a​i​l​.​c​o​m​with your details.